A super fun thing just happened! The doorbell rang but no one was there. Instead, there was a paper egg stuck to our front door that said you’ve been egged. Oh my! Sounds bad at first, right? I can just imagine the yolk drooling down the garage door. Bring back any high school memories? No worries though. It was a FUN egging! The kind of egging that actually gets the teenagers off their electronics to run out and find eggs that a mystery friend has left in our yard. Easter For Teenagers is still fun! There were 12 eggs filled with coins, candy, and, wait for it, one was empty. The empty egg was a reminder of Jesus’ empty tomb. What a fun way to bring joy to friends and family! So fun, in fact, that we wanted to share the joy. Consider yourself egged by us here at Sunshine and Rainy Days! Would you like to do some egging yourself? Twelve Eggs! Not REAL ones! Stuff to fill 11 eggs. Candy, money, little toys, etc. Fill 11 Plastic Easter Eggs with candy, money, or little toys. 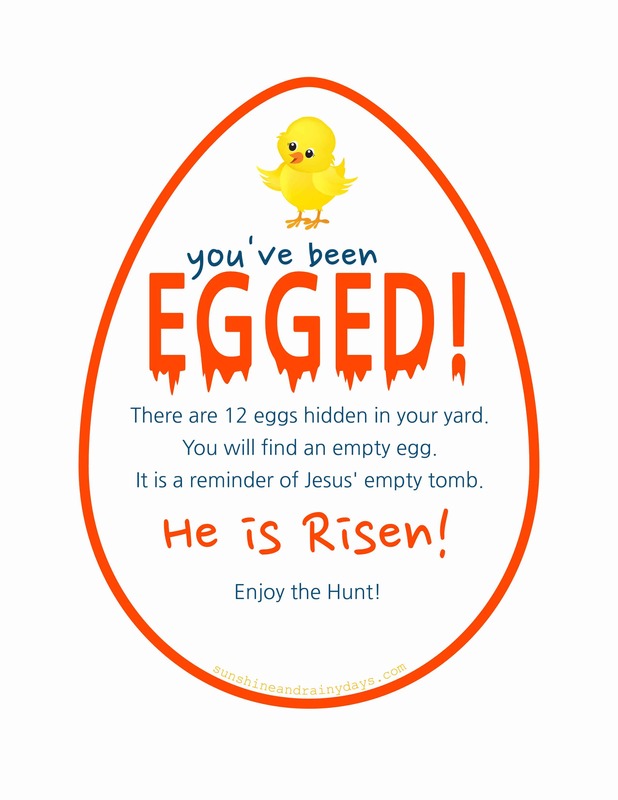 Print You’ve Been Egged printable on card stock. 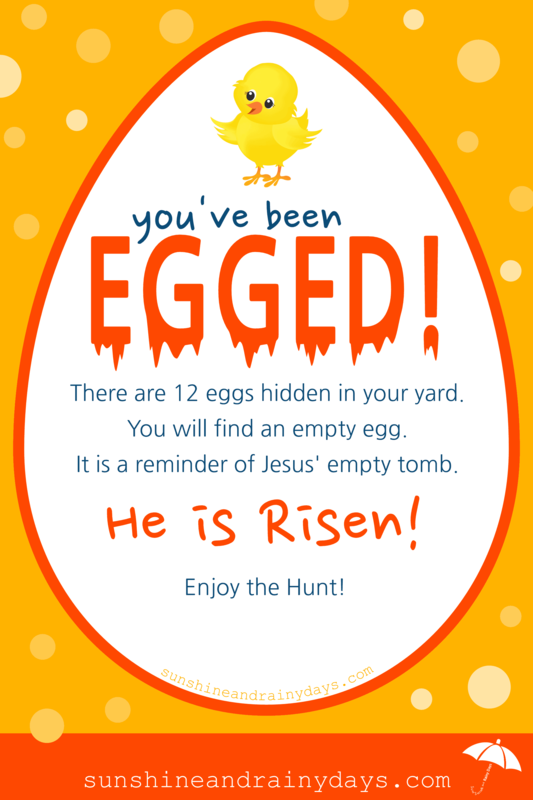 Go to a friend’s house and scatter the 12 eggs around their front yard. Tape the You’ve Been Egged printable to their front door. Ring the doorbell and run! You just brought JOY to your friends and celebrated the fact that Jesus is Risen! Click the image below, print the PDF, cut it out, and egg away! What in the world do eggs have to do with Easter? Check out this article to learn a little more.